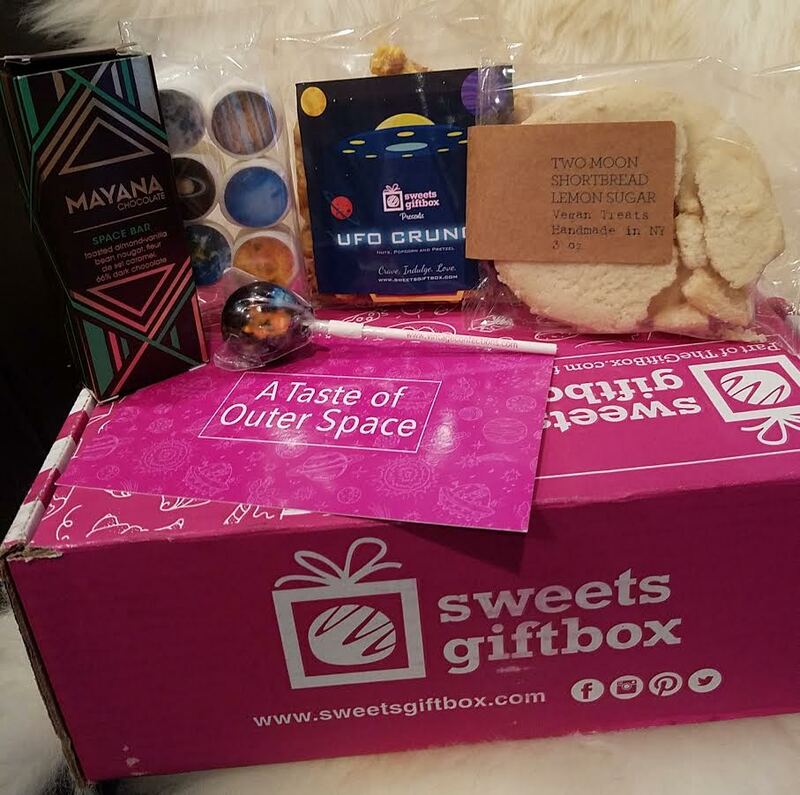 SweetsGiftBox sends tasty baked goods, candies and treats to your door every month. This month was a total win for me because I loved everything in it. This is a fairly new subscription under the TheGiftBox umbrella (they also have boxes for pets and are still expanding). I'm curious to see how this box progresses. 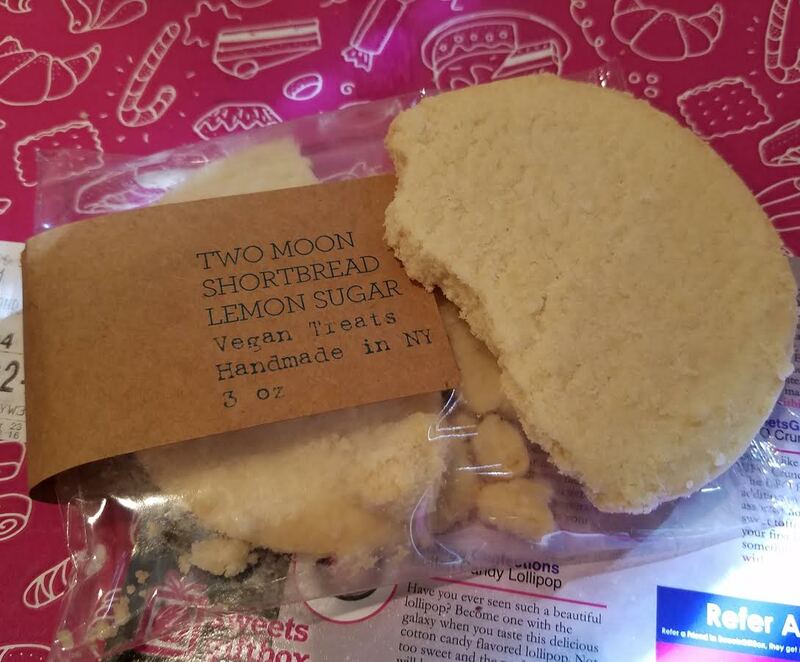 It's a little bit different than other treat boxes because it doesn't stick to just independent confectionaries and small businesses necessarily. The theme this month is probably the best theme I've seen for a box of desserts. It's "Space" and the contents are so fitting it's fun! 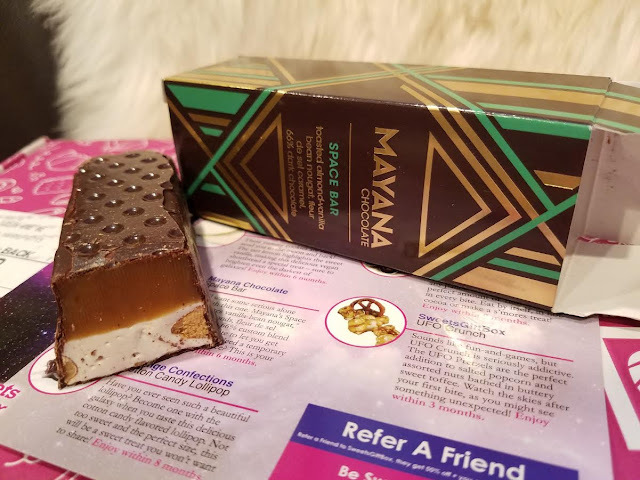 Mayana Space Bar Chocolate Bar- This brand has appeared before in this box but everything is always fantastic. This has nougat and caramel wrapped in dark chocolate and it's HEAVENLY! It's irresistible. Meaning I can't resist. That's why it's half gone in this photo. Out of this world! Two Moon Shortbread Lemon Cookies- These arrived broken (and I have to admit that packing is definitely an issue with this box, everything is just tossed in) but still edible, of course. I don't really like shortbread but this cookie literally melts in your mouth. It's wonderful! So I'm hoarding these and eating it in small pieces and trying not to snarf everything instantly. 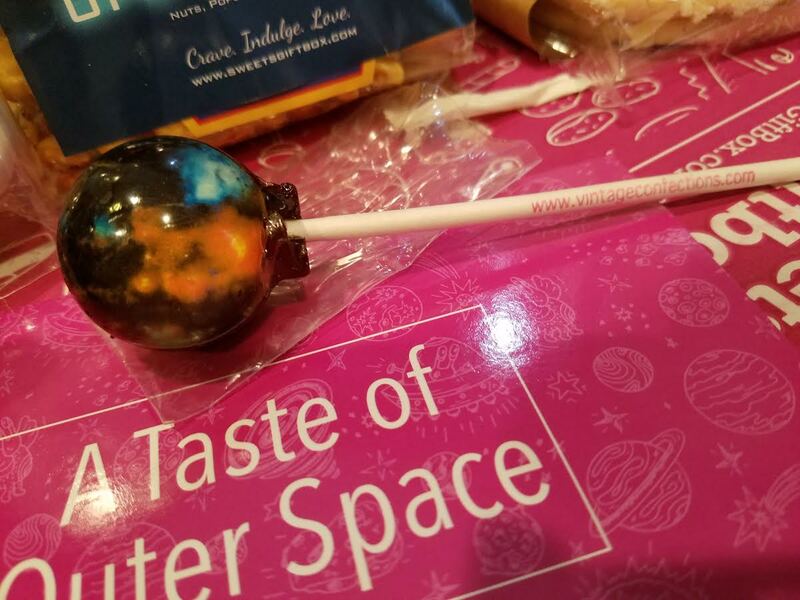 Vintage Confections Cotton Candy Pop- A space view lollipop. As tasty as you'd expect (mostly sugar) but fun. 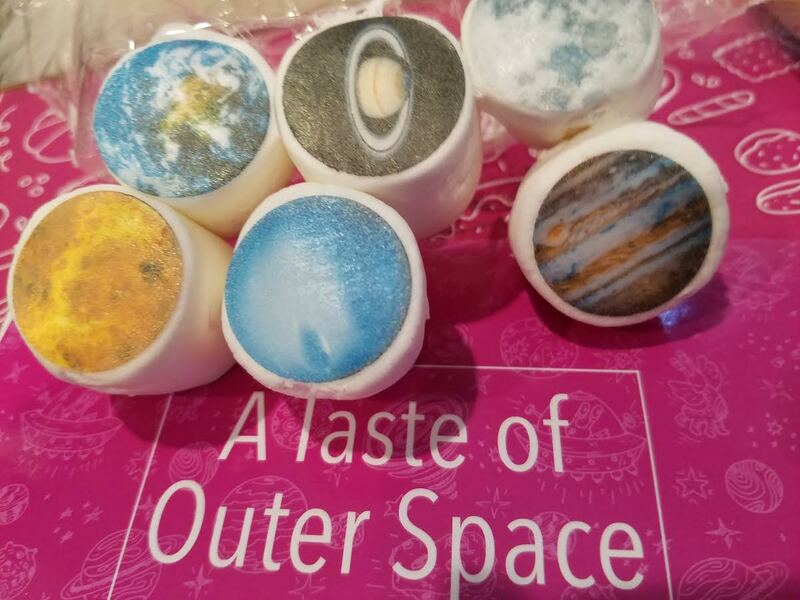 Vintage Confections Space Marshmallows- Large marshmallows with an edible planet sticker on top. They taste kind of lemony to me. And I did peel off the planet sticker because it interferes with the fluffy marshmallow goodness. 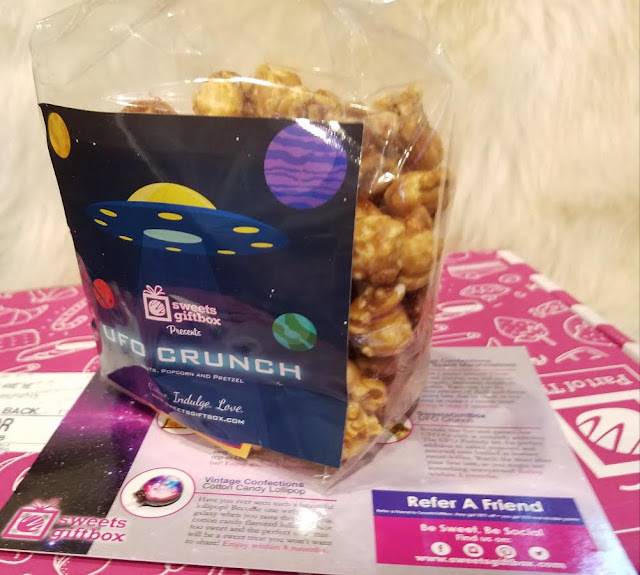 SGB UFO Crunch- Caramel popcorn with pretzels and nuts. I think this is repackaged for SweetsGiftBox. It's pretty tasty, I can't lie! VERDICT: So I'm totally in love with the Mayana bar. The lemon shortbread is also delicious and who can resist caramel corn? Not me. I like sweet snacks like these and ate everything in the box (or most of it so far). So I can't complain about the tastiness of the contents. I still think it's overpriced at $25 but everything is so delicious! And while I love the Mayana bars, the brand was in last month's box, too. Growing pains, maybe. If you would like to sign up for SweetsGiftBox, you can do that here. Use code BITSANDBOXES for 50% off your first box. The Mayana Space bar kind of reminds me of a fancy Mars bar! Did you try one when you were in Ireland?